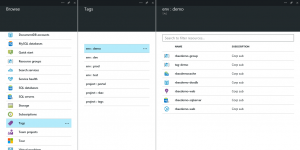 In the full Azure portal, subscriptions are the only way to organize and group resources. In the Azure Preview portal, Resource groups allow you to manage related resources as a single unit, which became even more valuable with role-based access control. Now, you can tag resources with name/value pairs to categorize and view resources across resource groups and, within the portal, across subscriptions. To get started, open any resource in the Preview portal, click the Tags part to add or remove tags for that resource, and click the tag to view all resources and resource groups with the same tag. Pin the tag blade to the Startboard to access it quickly and easily, or use the Browse hub to navigate to any tags across all your subscriptions. You can also manage tags using Azure PowerShell or by using the Azure Resource Manager REST API Reference. Learn more about using tags to organize your Azure resources.